The Jacques Israelievitch Scholarship in Interdisciplinary Arts will be granted to a full time graduate student enrolled in the School of the Arts, Media, Performance & Design. To be eligible students must demonstrate outstanding academic merit, artistic excellence and an artistic practice of interdisciplinary and cross-departmental nature. Students must demonstrate their interdisciplinary vision and a special gift of the arts through a one-page application statement. Preference for this award will be granted to students who have a musical component to their vision. The selection process will be coordinated by the AMPD Office of Advising and Integrated Student Services (OAISS). 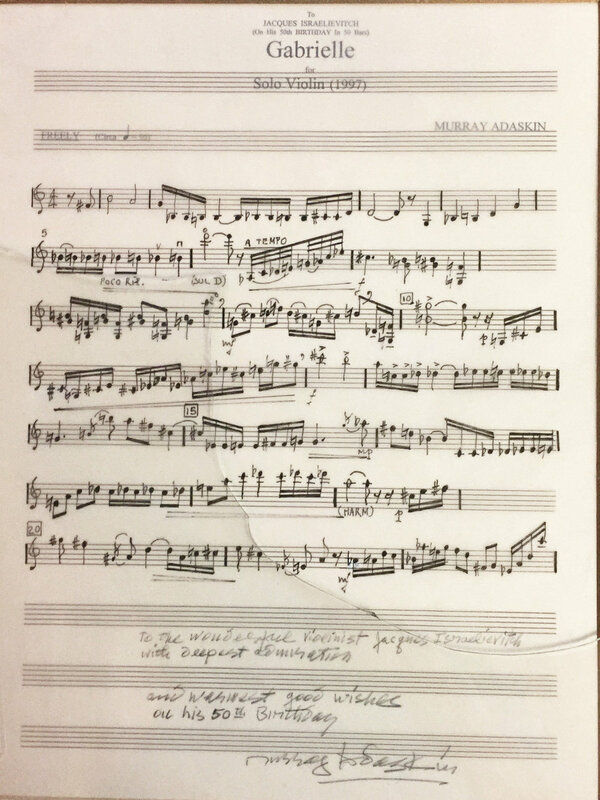 This composition was the result of my request that Murray write something for solo violin in honour of Jacques’ 50th birthday. Bob’s many offerings often came with instructions: Don’t just LOOK AT this bowl. USE IT! Jacques gave Joseph his chevalier award and asked him to make the frame more important than the paper. The certificate has slipped deep into the frame, but this is how it is. This vase is one of two Ron made for Jacques with figures playing violins. Greg made several portraits of Jacques over the years. This is a print of one of them. The portrait he is painting in the photo now hangs in the office of the chair of music at York. This poster of Jacques features Sherry Pribik’s reconstructed violin. Jacques found an old violin at a junk shop and gave it to Sherry with the request that she ‘do something’ with it. She hacked it up and sewed it back together. Tony began this drawing at one of our salons. He often listened to the music with pencil and paper in hand and he says he’s always listening to music—often Jacques’—as he works in his studio.